No offense intended to the former Todd, Adriana or Francis, but it’s fair to say that coming into the series, Andre Braugher was the best and most accomplished actor among the main and supporting cast (and guest stars, while we’re at it). This was so abundantly clear to many critics that one of their main complaints was that an actor of Braugher’s caliber should not be wasting away on such a frivolous endeavor and, furthermore, that he was not enjoying working on a particularly zany sitcom. But through nine episodes, this storyline had reversed itself entirely. Braugher’s Captain Holt remained a significant character, but others had more time devoted to them and were more fully developed. Up until “Thanksgiving,” Holt was simply a shrewd, stoic father figure whom Peralta, Santiago and the others looked to for support. Then came Gerald Jimes. (Gimes? This is unclear.) But when Holt and Peralta must leave Santiago’s grand feast of inedible Thanksgiving foods to track down stolen evidence money, Holt finally breaks his stony façade. Peralta, as he is wont to do, generates fake backstories for the two of them, and for Holt he creates the tragic Jimes who has solved every crime except one — the murder of his wife. 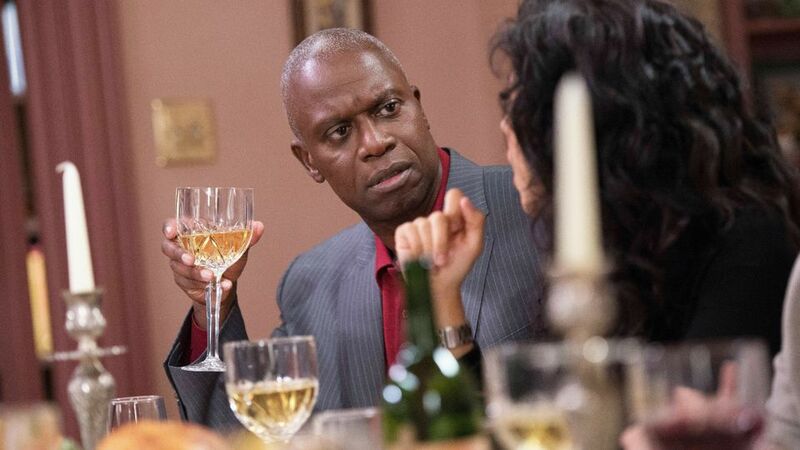 Holt’s response is typically unamused at first, but when he has to loudly intervene in a domestic squabble, he fully adopts the entire Jimes persona. Peralta calls this a big breakthrough for Jimes, but in reality it’s a much bigger breakthrough for Holt. He has finally accepted both Peralta’s and the precinct’s unorthodox but effective crime-fighting methods. He no longer uses a rigid, my-way-or-the-highway approach in the molding of his detectives, but instead shows greater appreciation for their strengths. And most importantly, he had fun. When Holt and Peralta return to the precinct, they find the entire detective staff hungrily complaining (especially Terry) because Amy’s dinner was terrible, and her attempt at being spontaneous got them kicked out of the only bar in Brooklyn (apparently) before the kitchen reopened. The night is an impossible failure for Santiago, who only held the dinner to impress Holt—a fact that tickles Gina tremendously. (“That was before I knew I could get up on this high horse. Love the view up here. Clip clop. Clip clop. Clip clop.”) Ultimately, however, everyone’s appetite for food/recognition/familial warmth/train-wreckage is sated when Boyle procures a take-out Thanksgiving dinner from various restaurants around the city (including a no-notice Peking duck). What results is a Thanksgiving special fully in the style and personality that Brooklyn Nine-Nine has established—loud, awkward, a little gross but very funny—while using just enough schmaltz to build the audience’s love for the characters even more. Holt breaks out of his shell, Peralta learns the true meaning of Thanksgiving, Santiago receives approval from Holt, and Boyle further impresses Diaz. And, best of all, we get a great show.